Unabashedly anti-gay school district policies are on the up and up in America. For all our victories in winning LGBT students to great Gay-Straight Alliances in their school, these efforts are a pittance compared to the districtwide and sometimes statewide bans on even the mention of the words “gay” or “homosexuality”. Two high profile bans on discussion of homosexuality have made national news over the past six months. 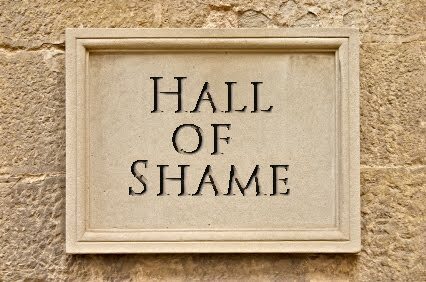 In today’s School Halls of Shame Face-off, we ask you to decide which is the greater of the two evils. First up is Tennessee’s Don’t Say Gay Bill. Introduced by Rep. Stacey Campfield (R), the bill outright bans all mention of homosexuality or even the word “gay” in Tennessee K-8 schools. Students being bullied or even physically attacked because of their perceived sexuality are legally prevented from saying so to teachers or counselors. Guidance counselors and trusted teachers are banned from continuing a conversation with a student coming out to them. Health and biology classes are legally required to pretend that homosexuality doesn’t even exist. Gay teachers and administrators will be barred from speaking about their spouses or home life with co-workers and students. None of this is hyperbole. The Tennessee Don’t Say Gay Bill seeks to make it a crime to even acknowledge that gay people exist. And it has already been passed by the TN Senate. Meanwhile to the north in Michele Bachmann’s congressional district, Minnesota’s Anoka-Hennepin School District has recently come under fire for it’s No Homo Promo, a policy requiring teachers to remain “neutral” on issues involving homosexuality. The No Homo Promo policy in the Anoka-Hennepin School District has led to the suicides of NINE students in the district over the past two years, the most in any district in the country. Bachmann, who has referred to gays as “belonging to Satan”, refuses to acknowledge the suicides in her district – perhaps because that would involve breaking the No Homo Promo rule. The No Homo Promo is now under federal investigation for it’s part in the deaths of the students forced to live under its vile rules. Both policies are absolutely devastating to the wellbeing of children in the care of those creating these rules, but if you had to pick one as the worse of the two, which would it be?